Spring Brook Pathway is a somewhat obscured trail, hidden among the heavily wooded Chandler Hills near the Charlevoix/Otsego/Cheboygan County border. Often overlooked except by locals, the pathway is a delightful winter route thanks to all that elevation. The trail consists of two loops with the first one winding through a low-lying cedar swamp that surrounds gurgling Spring Brook. The second loop climbs to the top of a ridge where there are views of the rugged terrain that make this corner of Charlevoix County so unique and once home to Thunder Mountain Ski Area. The first loop makes for a short and easy outing of 1.5 miles. 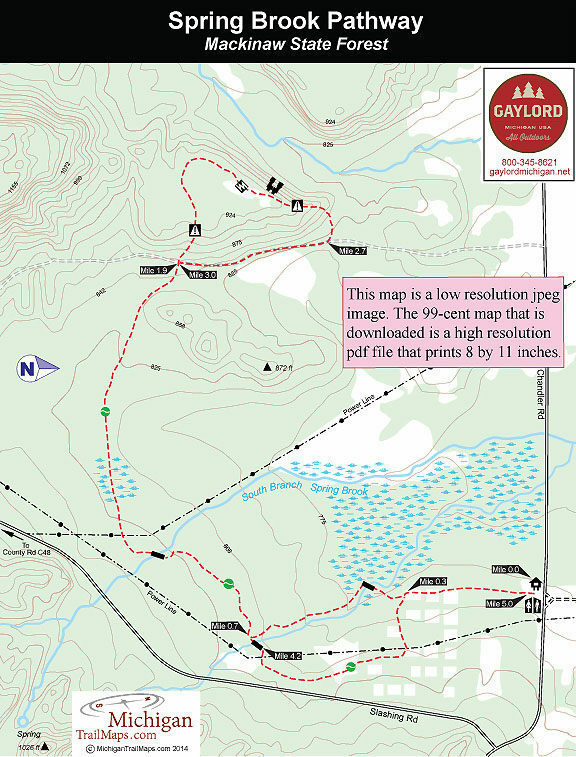 The entire trail, including backtracking the segment that connects the two loops, is a 5-mile trek of moderate difficulty. In the winter Spring Brook is a backcountry ski, where you may or may not be breaking trail the entire way, or an excellent snowshoe route. The rest of the year the trail is open to hikers and mountain bikers but keep in mind that the first loop will be wet, particularly in spring. One way to avoid this is to begin and end with the eastern half of the first loop, avoiding completely the western half and the cedar swamp along the stream. The trail has been re-routed since 1990 and DNR maps are not totally accurate. They tend to show three loops but the middle of the trail system is no longer a loop. 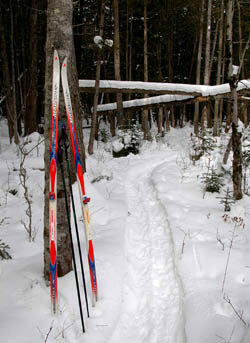 The trailhead is an open parking lot of Chandler Road that is bordered by a snowmobile trail. Head south to escape the roar of the machines and within a third of a mile is the first of three junctions. Head right to enter the cedar swamp that in the winter is a joy to be in. No bugs or mud holes at this time of year, snow blankets everything. The cedars are a jumbled forest, dark and ominous and almost evil looking in the way they lean every which way. At Mile 0.4 you cross a branch of Spring Brook and then follow the west bank of stream that remains open no matter how cold it gets. Skiing can get tricky here as you have to negotiate a handful of fallen trees along a narrow winding path. At Mile 0.7 you arrive at the second junction. To the east (left) is the return to the trailhead and another bridge. To continue with the pathway head west (right). 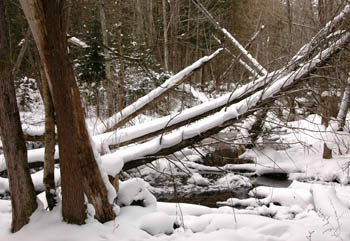 At Mile 1 you use a bridge to cross another branch of Spring Brook and then emerge into the open lane of a power line. The trail is clearly marked on the other side where it enters a young hardwood forest. Soon you’re passing through another cedar swamp but here the pathway follows an old railroad grade, no doubt leftover from the logging era. The raised bed is easy to envision as a railroad and during the summer keeps boots and the fat tires of mountain bikes out of the swamp. The pathway crosses a pair of two-tracks, the second one at Mile 1.9 is more distinguishable and signposted because it marks the final loop. You can turn north (right) on the two-track or head straight and begin climbing. Most skiers head straight as the trail well marked and more obvious in this direction. You’ve already gain 75 feet since departing from the trailhead but another 75 feet must be climbed before you top off on the edge of a ridge. Through the trees there are views of a valley below containing another branch of Spring Brook and enclosed by more ridges that roll into the horizon. If you packed along a thermos of hot chocolate, this is where you want to enjoy it. You skirt the ridge for a spell and then at Mile 2.4 begin a long dog-leg descent that within a quarter mile bottoms out at the two-track. Head south (right) and at Mile 3 the pathway arrives at the junction passed through earlier. Turn east (left) here to backtrack along the old railroad grade. You return to the second junction at Mile 4.2 and this time cross the bridge over Spring Brook. The east half of the first loop is probably least interesting stretch of the trail. It passes through open areas, the remnants of a hardwood nursery and twice passes underneath another set of power lines. Keep an eye out for trail markers and blue blazes painted on trees to reach the first junction at Mile 4.7. The parking area just a third of a mile to the north. Along with a parking area, there is a vault toilet at the trailhead but no source of drinking water. A state park annual pass or daily vehicle entry pass is required for Spring Brook Pathway. From I-75 north of Gaylord, depart at exit 290 and head north away from Vanderbilt on County Road C-48. Within 2.5 miles C48 swings west as Thumb Lake Road. Turn north (right) on Slashing Road 10 miles from I-75 and in 2.3 miles turn west (left) on Chandler Road. The trailhead is just a half mile west on Chandler Road. Contact the Gaylord office of the Department of Natural Resources (989) 732-3541. For snow conditions contact the Gaylord Area Tourism Bureau (800-345-8621; www.gaylordmichigan.net).